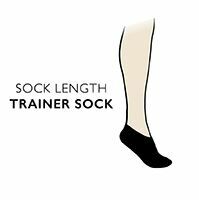 Summer shoes and sports footwear need a good, comfortable low ankle sock to keep feet fresh and dry - even if you adore the sockless look, your skin really doesn't! Missguided Plain Cotton Secret Socks are soft, light and fine, fitting below the ankle to keep them stylishly out of sight while you wear them. Available as a twin pack, these socks have plain feet with contrast coloured heels and toes, along with the ‘Missguided’ logo on the soles, to create a little extra interest should you choose to slide your shoes off for a while. Missguided Plain Cotton Secret Socks are especially cotton rich, making them kind to most kinds of skin, moisture-absorbing and breathable.